Our Bilberry POWDER is a 4:1 fruit extract powder. so it's 4 times more potent and concentrated than other powders. Bilberry has been used in traditional European medicine for almost a thousand years. the wild Bilberry is loaded with potent antioxidants including flavanoids and anthocyanins. Bilberries also have high levels of tannins which are astringent plant polyphenols. These major components are responsible for Bilberry's powerful antioxidant activity. which may have amazing anti-aging, anti-oxidant and healing qualities. Anthocyanins can fight free radicals in the body, strengthen blood capillaries and improve overall circulatory health. Bilberries may strengthen coronary arteries by fighting the accumulation of digested fat. the potential health benefits are numerous. The USDA recommends an intake of about 5,000 ORAC units a day. Unfortunately, the average person only receives about 20%-25% of this amount. Adding our Bilberry powder to your diet can quickly increase your daily ORAC value. 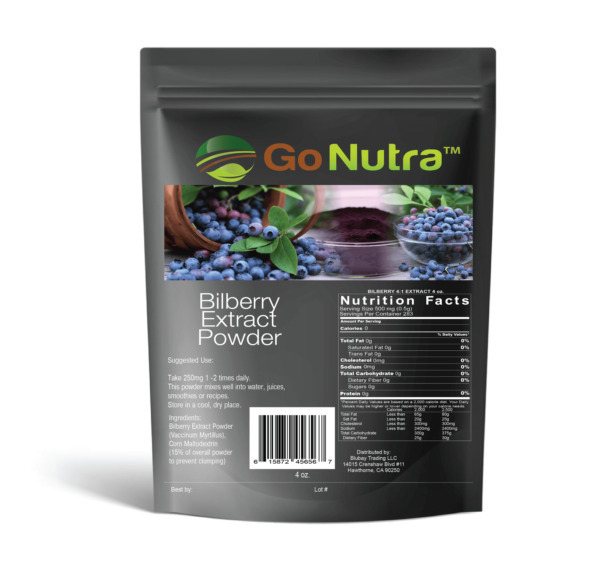 Our Bilberry 4:1 Extract Powder is the most potent form of Bilberry available. Bilberries are said to improve vision , support eye health and help with eyestrain. maintain healthy cholesterol levels, and relief for nausea and indigestion. good cardiovascular health and a strong immune system. kidney and urinary tract health, as well as supporting healthy menstruation and digestive health. juice, cereal, ice cream and so much more. Our BILBERRY FRUIT powder is of Premium quality. This information should not be interpreted as medical advice. The descriptions and statements accompanying these products have not been evaluated by the FDA. It is advised to consult your physician before beginning any supplement.